As Borders faces a potential liquidity crisis, is the bookseller headed on the road to a Ch. 11 filing? Take our poll and see what TheStreet readers are saying. NEW YORK ( TheStreet) -- Is Borders ( BGP eyeing a bankruptcy filing? If the bookseller's latest moves are any indication, that could be exactly the direction the company is headed, according to James V. McTevia, turnaround expert and managing member of McTevia & Associates. On Monday, the Wall Street Journal reported that one of Borders' major suppliers is temporarily halting the shipment of books to the retailer. The report cited publisher Rowman & Littlefield Publishing, whose CEO told the Journal that it has stopped shipping to Borders until it has more information on its payment plans. Borders said in the end of December that it may have to delay payments to some of its vendors as it attempts to negotiate new loan terms. "Being unable to pay your bills suggests a serious cash crisis and is generally a precursor to bankruptcy," McTevia says. "Borders is clearly exploring that option." Borders has also warned that delaying these payments may result in a violation of the terms of its existing credit agreements in the early part of the year, and that it could experience a liquidity shortfall. Earlier in the week Borders also announced the resignation of two executives, Thomas D. Carney, executive vice president, general counsel and secretary; and D. Scott Laverty, senior vice president, chief information officer. Reasons for their departures were not provided. "We think it is likely that Borders will violate the terms of some of its credit agreements early in 2011, raising questions about its long-term viability," wrote Michael Souers, analyst at Standard & Poor's. "While efforts to restructure its debt are taking place, we see onerous terms even if successful." Investors received a shot of optimism late in the week, when the Wall Street Journal reported that Borders is in discussions with restructuring advisors and is not seeking bankruptcy lawyers. According to reports, Borders hired FTI Consulting and is in talks with Jefferies & Co. It has also been working with one of its lenders, GE Capital, about new debt that could replace its current credit line, Reuters reported, citing sources familiar with the matter. As a result, shares of Borders are surging 20% to $1.04 in premarket trading on Friday. 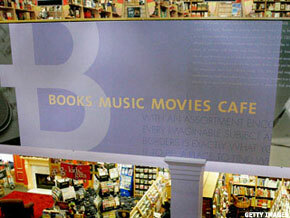 One of the few ways Borders can save itself is to merge with rival Barnes & Noble ( BKS - Get Report), McTevia says. Barnes & Noble has been slightly more successful than its peer in attempting to compete in the rapidly changing book industry. On Monday, the No. 1 book seller said that same-store sales for the nine-week holiday period jumped 9.7%, as its Nook e-reader became its best selling item of all time. This topped its prior forecast of a gain between 5% and 7%. Barnes & Noble put itself up for sale in August, and in December, hedge fund manager William Ackman, who owns a 37% stake in Borders, said he was prepared to back a cash merger deal. Ackman proposed Borders purchasing Barnes & Noble for $16 a share. "People who say the two shouldn't merge aren't looking at the whole picture," McTevia says. "If a merger doesn't take place it leaves two giant companies out there trying to compete in an industry that is going through major changes." Is a Borders bankruptcy imminent?